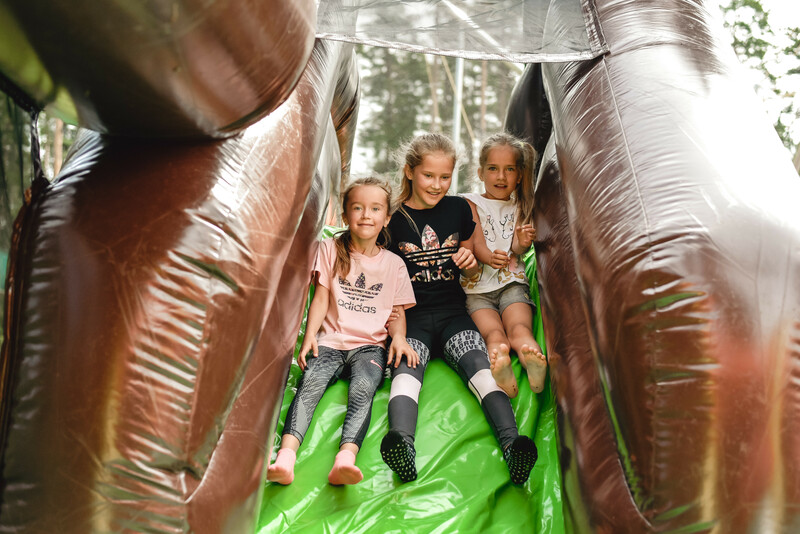 "Kokos rieksts" is an obstacle track divided into 5 separate sections in which the highest point reaches up to 15m from the ground. 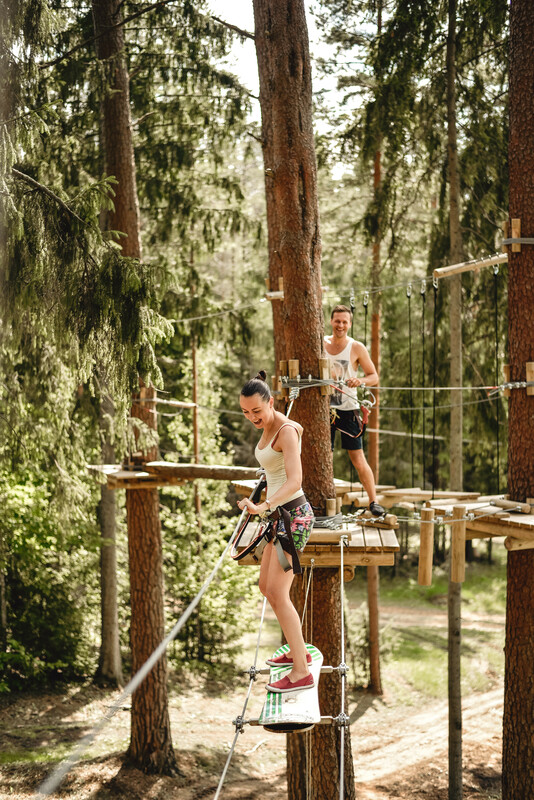 The tracks have different levels of complexity - a great opportunity to check your physical strenght while walking through the tree peaks. 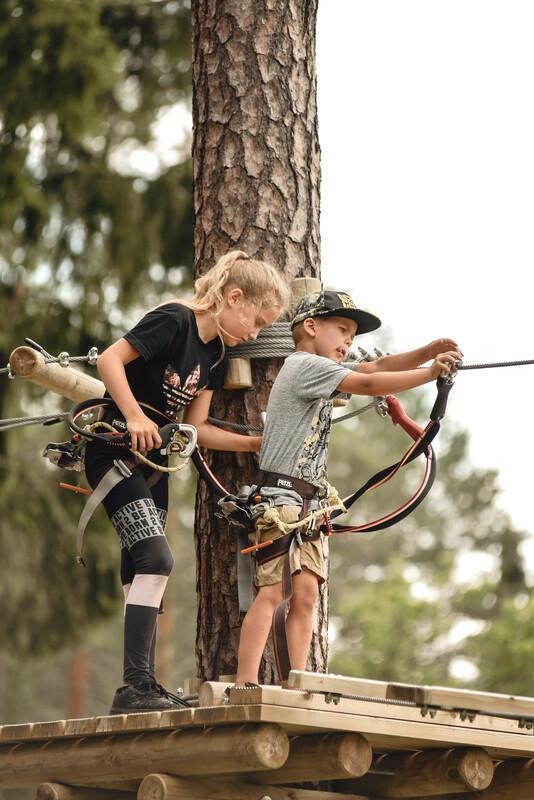 The safety system used to navigate the obstacle tracks is a high-quality carabines operating in a synchronized mechanism - the CliC-iT which is made in France can not be unlocked at the same time if one is in use but the other is not, thus avoiding the number of accidents and improving the safety while staying in the track. 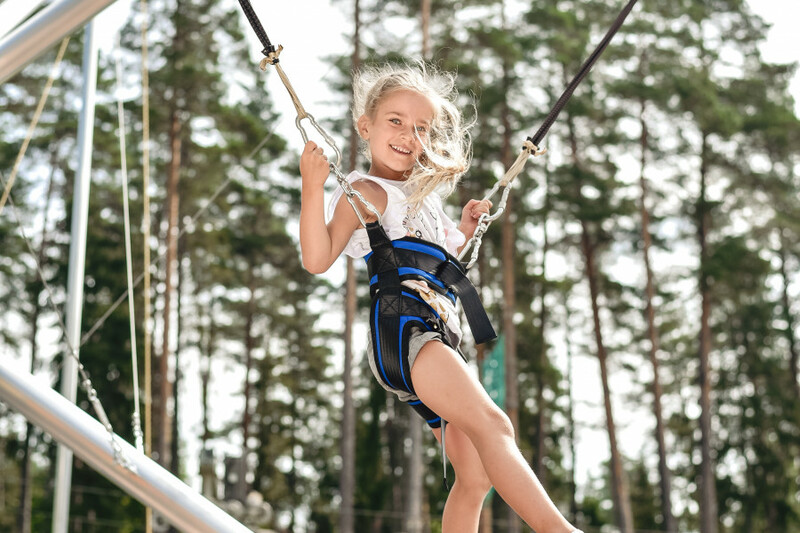 It's suitable for everyone, children must be at least 1m of heights. 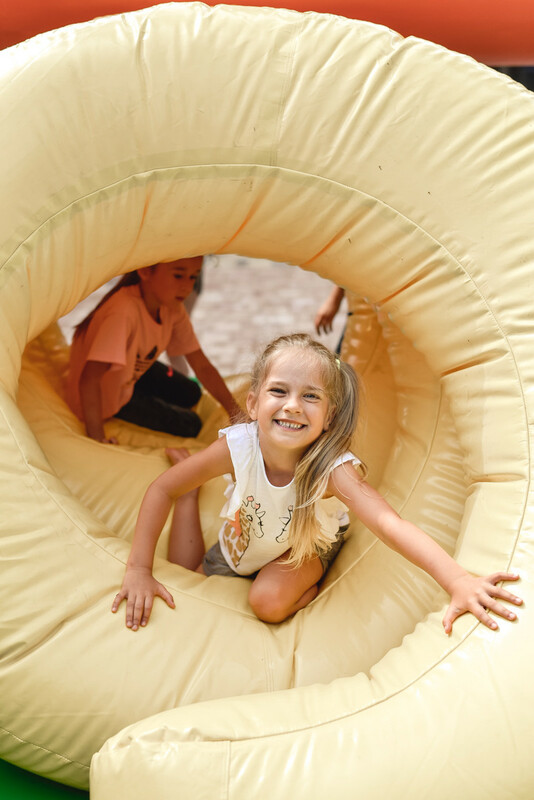 If they are smaller but still want to go on the obstacle track, they will need to be accompanied by an adult. 1. Height restriction: from 100 cm. 2. Smaller children may go in the track accompanied with an adult. 3. 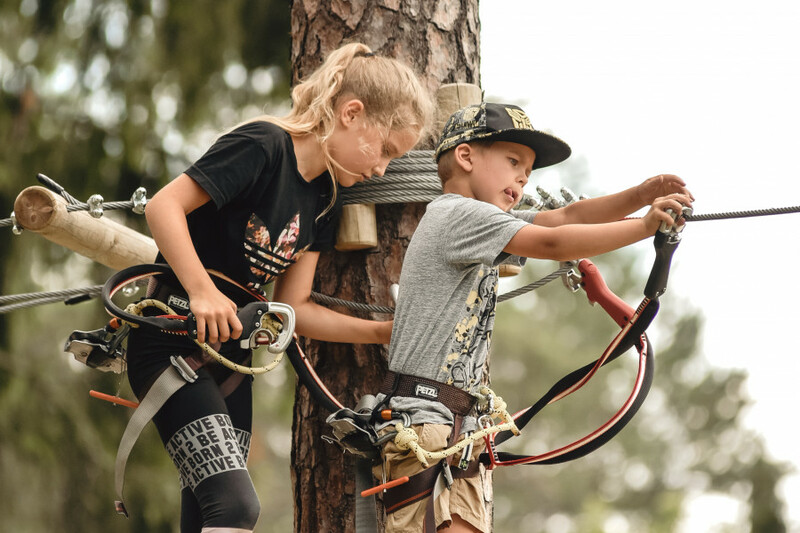 While being in the adventure park use the equipment provided only by Riekstukalns! 4. Use toe closed shoes. 5. Longer hair should be made in a ponytail or braid. 6. Only 1 person on the obstacle! 7. Maximum 2 people on the platform! 8. Use the trolley where rope is marked with yellow colour! 9. 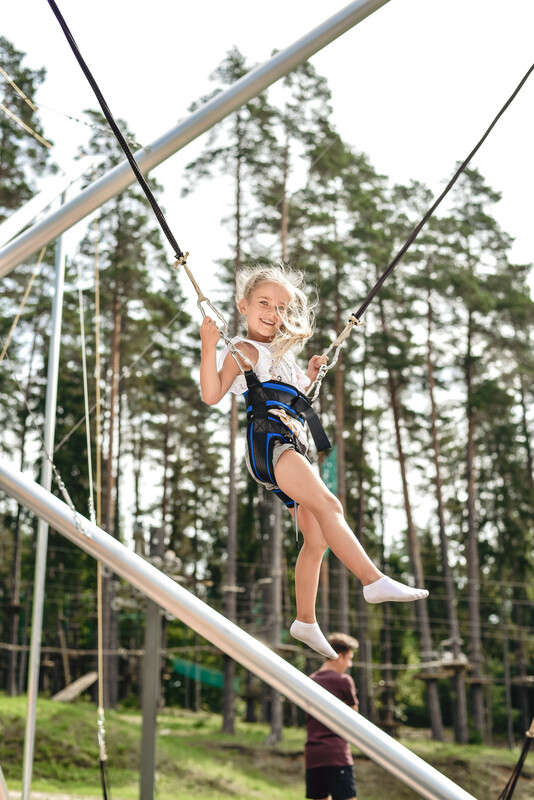 On the zipline put the trolley between yourself and safety carabine! 10. 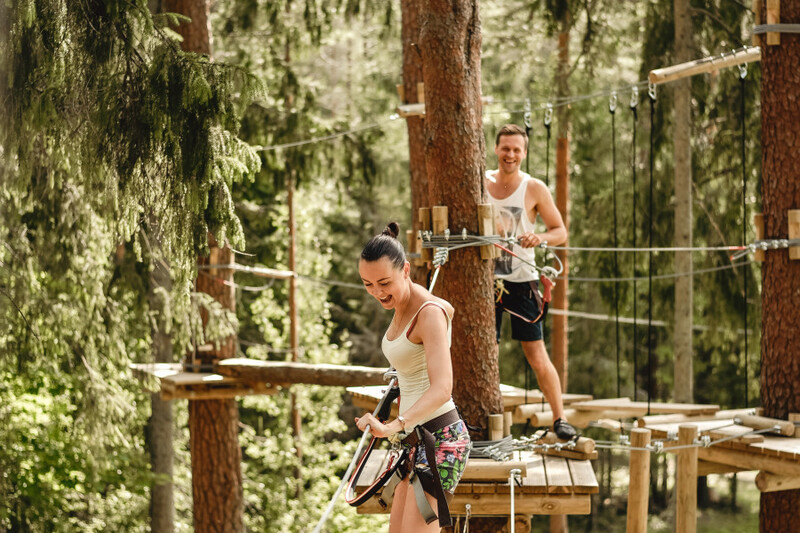 Don’t touch the rope while ziplining! 11. Hold on the belay while ziplining! Love speed? 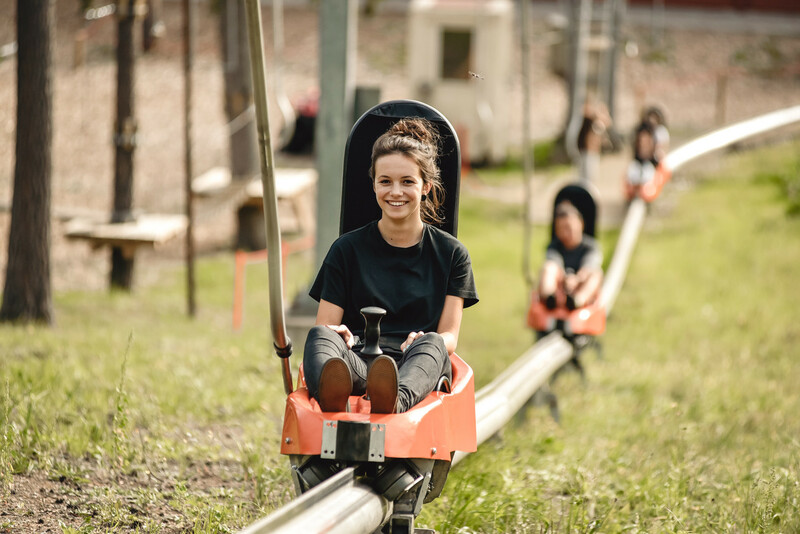 It is possible to develop up to 40km / h on summer toboggan through a 315m long ride! Catch positive feelings and wind in your hair! 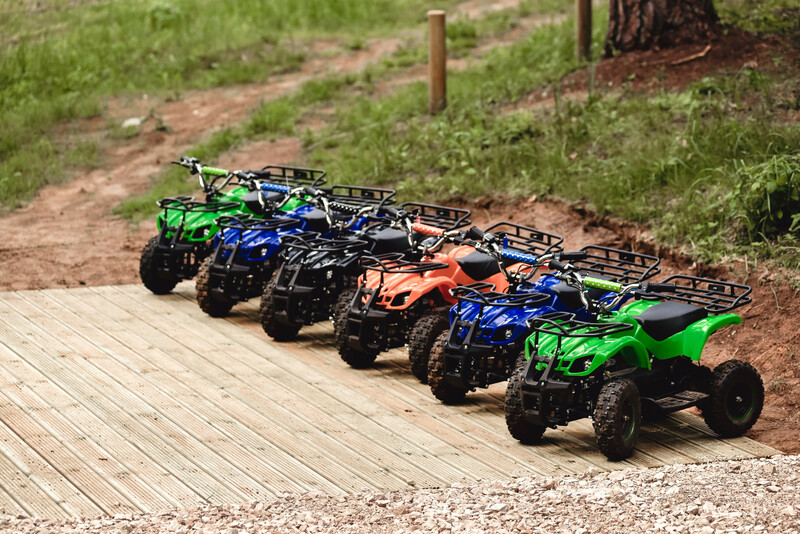 It's suitable for everyone - to ride alone or together with your little one. 1. Riding is forbidden in case of rain or if the track is wet! 2. Children under 7 can use the toboggan only if supervised by a person that is at least 16 years old. 3. 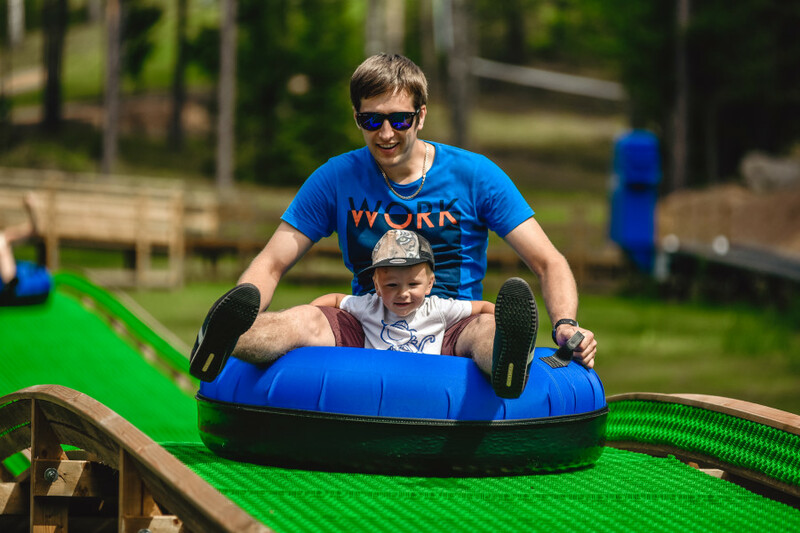 Children over age of 7 can use the toboggan alone if they can pull the control lever for increasing the speed and for braking. 4. Longer hair should be made in a ponytail or braid. 5. Hats, bags, food, drinks, sharp objects and other things that can threaten the rider or can fall out of the pockets, should be left outside the toboggan. 6. It is forbidden to get in the toboggan without permission! 7. 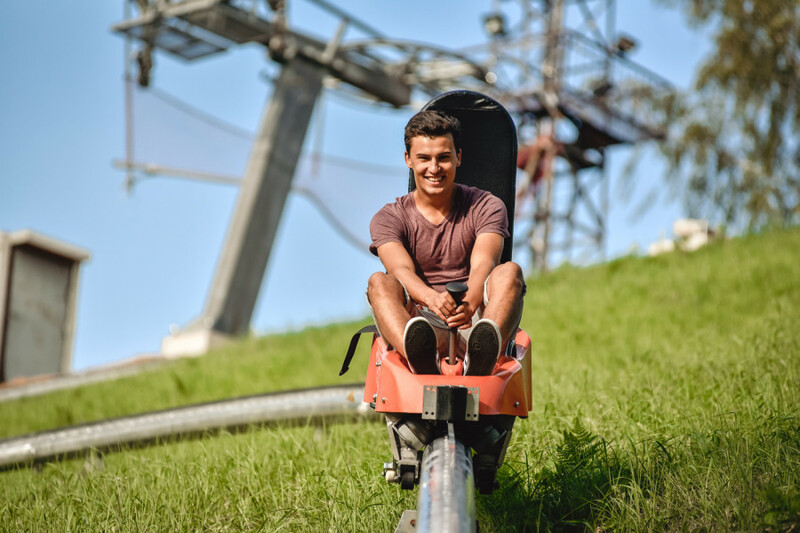 While sitting in the toboggan your body can not cover the black line as braking is disturbed! 8. Always fasten your seatbelt before the ride! 9. Wait for the green light to start the ride! 10. Don’t touch lifting device while going up! 11. To increase the speed push the control lever forward. 12. To slow down pull the control lever backwards. 13. Keep a 40 meter distance from other riders! 14. Don’t touch the track with your hands or feet! 15. Don’t stop during the ride! 16. Slow down before the turns! Control your speed with brakes during the ride! 17. Choose safe riding speed and slow down where needed! 18. 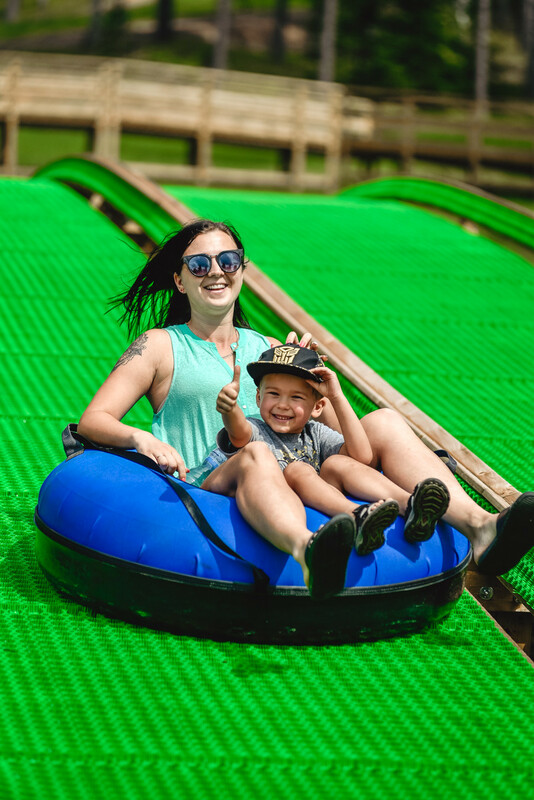 Step off the toboggan after the ride immediately! 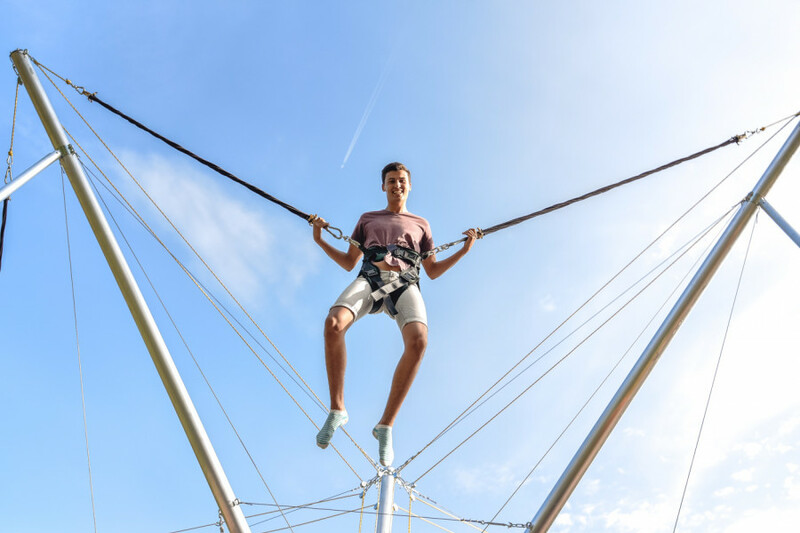 A fun attraction for both children and adults - a chance to make tricks and feel the gravity. 1. Weight limit: 16 – 85 kg. 2. Not recommended for pregnant woman. 3. Not recommended for people with heart or other serious diseases! 4. 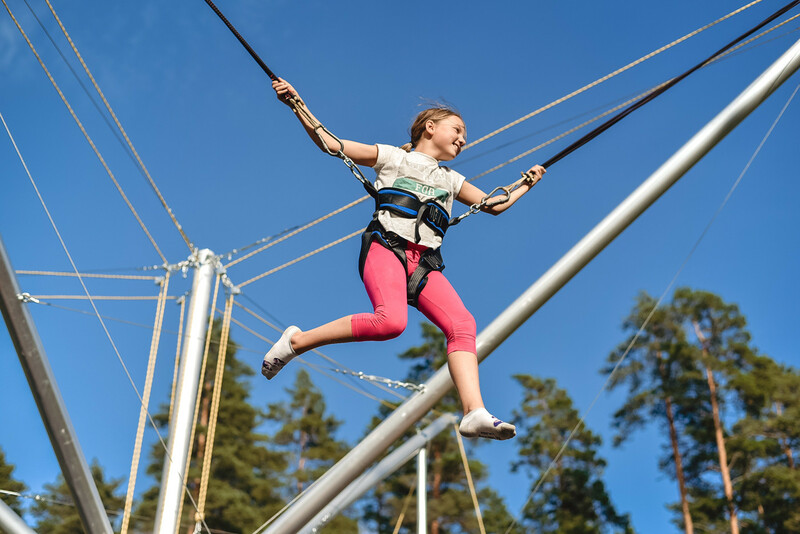 Hats, glasses, bags, food, drinks, sharp objects or other things that can threaten the participants or can fall out of the pockets, should be left outside the attraction. 5. Don’t wear shoes inside the attraction! 6. Only one person on the trampoline at the same time! 7. Please don’t disturb the participant in the attraction! 8. Don’t disconnect from bungee without the instructors permission! 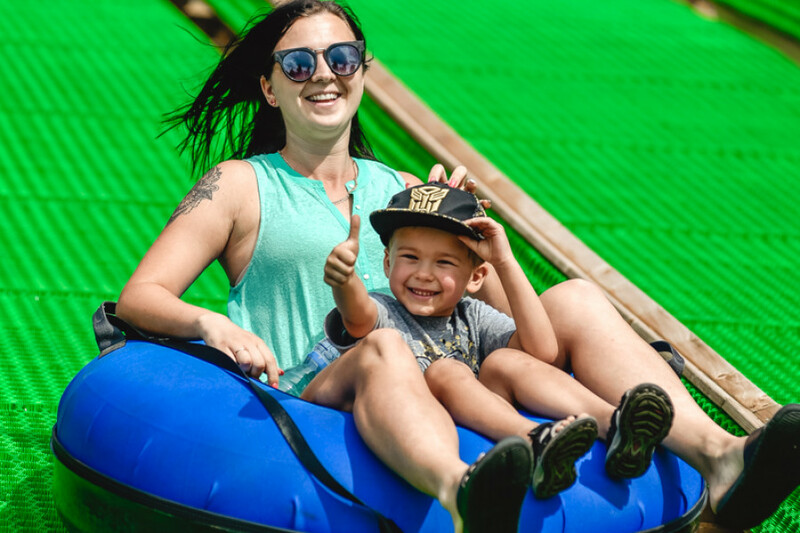 Race with friends or family members who will be the first to reach the finish line by slipping down a specially crafted artificial track. 1. Age restriction: starting from 3 years old. 2. Only 1 person in the tube! 3. 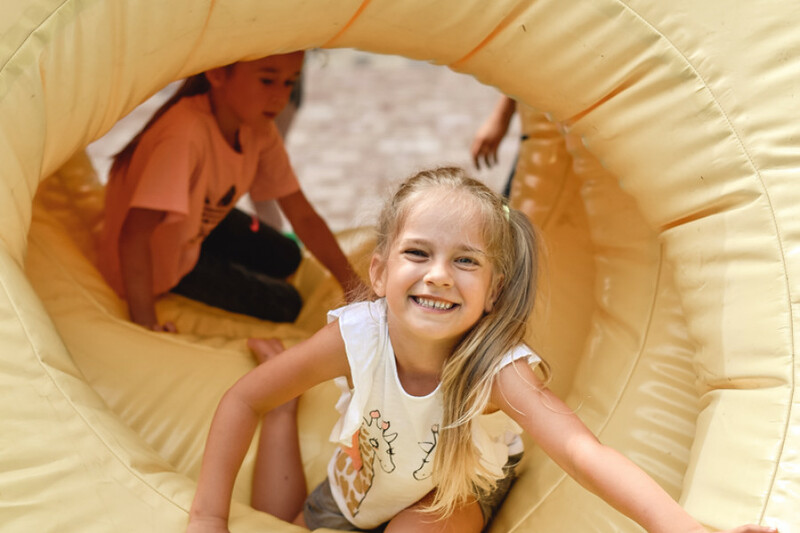 Children age 3-7 can be accompanied with a person that is at least 16 years old. Total weight can not exceed 120 kg. 4. Height restriction: not less than 1 m, not more than 2 m.
5. Not recommended for pregnant woman. 6. Not recommended for people with heart or other serious diseases. 7. Hats, bags, food, drinks, sharp objects and other things that can threaten the rider or can fall out of the pockets, should be left outside the tube. 8. Tubing is forbidden under influence of alcohol or drugs! 9. Use toe closed shoes. 10. While going up please stand one after the other and hold the tube by rope behind yourself. 11. Don’t sit in the tube while going up! 12. Keep 2 meter distance from the previous tube! 13. 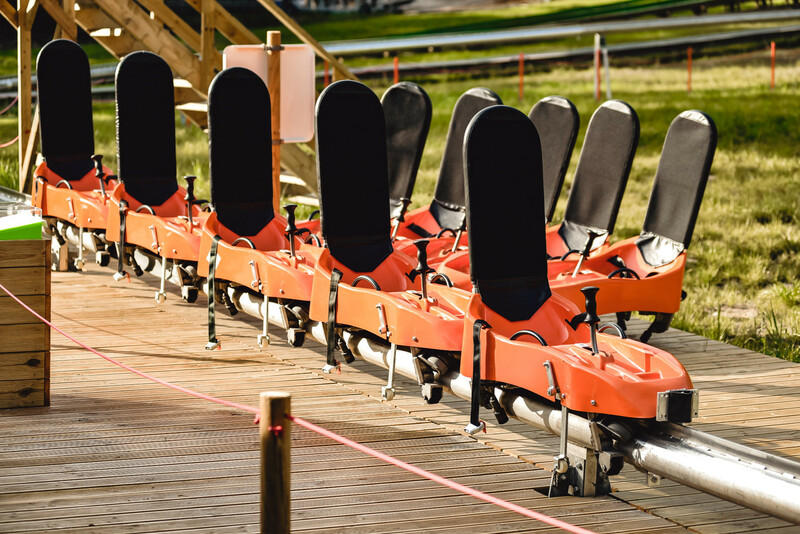 Take a big step to cross the marked finish line when getting off the lift! 1. Please use the tube only in the marked track! 2. Don’t sit on the side of the tube while riding! 3. Don’t lay on the tube on your stomach while riding! 4. Don’t put your legs inside the tube while riding! 5. Keep your legs outside the tube while riding! 6. 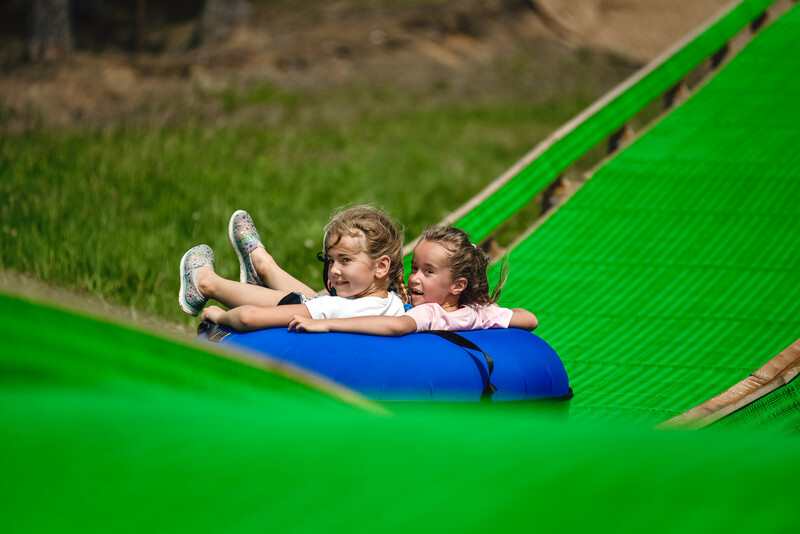 The rope of the tube should be inside the tube while riding! 7. Wait for the green light to start the ride! 8. Please hold the side handles while riding! 9. Please hold your child with one hand and side handle with the other! Make sure that the child is holding the handle with at least one hand! 10. Leave the track immediatly after the ride! 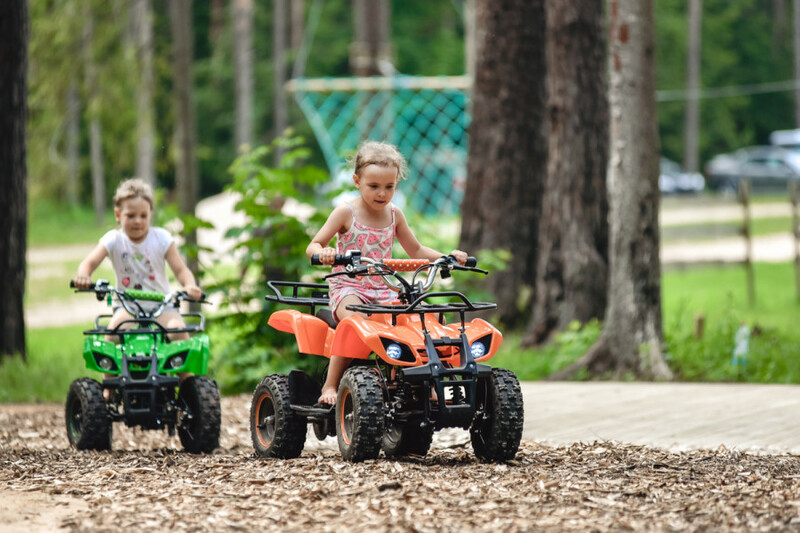 Children's quadbikes are available to our smallest visitors who want to enjoy driving pleasure. The speed is adjustable so the parents can chase the little ones while they are in the track. 3. 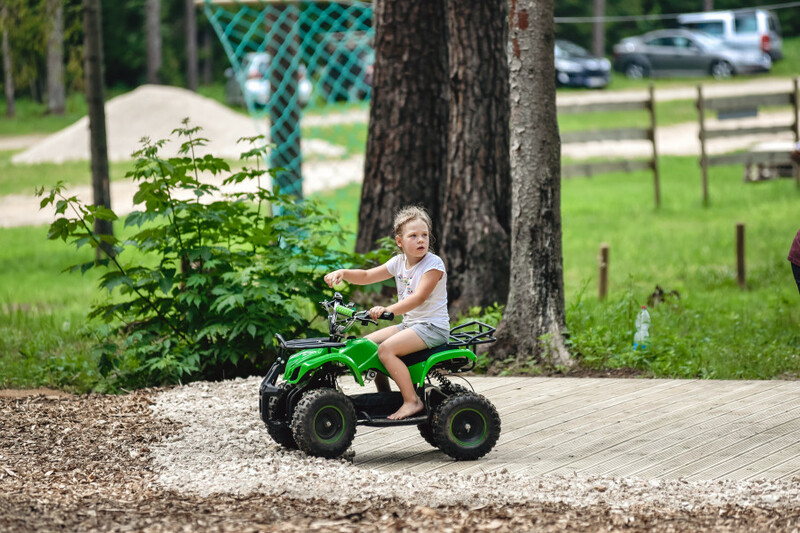 Only one person on the quadbike! 4. Please listen to the instructions how to drive the vehicle before going in track! 5. Keep the safe distance from other riders to avoid accidents! 6. It’s forbidden to change the driving direction of the track! 7. It’s forbidden to cause accidents with other riders intentionally! 8. Don’t ride out of the marked track! 9. Stop immediately after instructors call and follow his instructions! 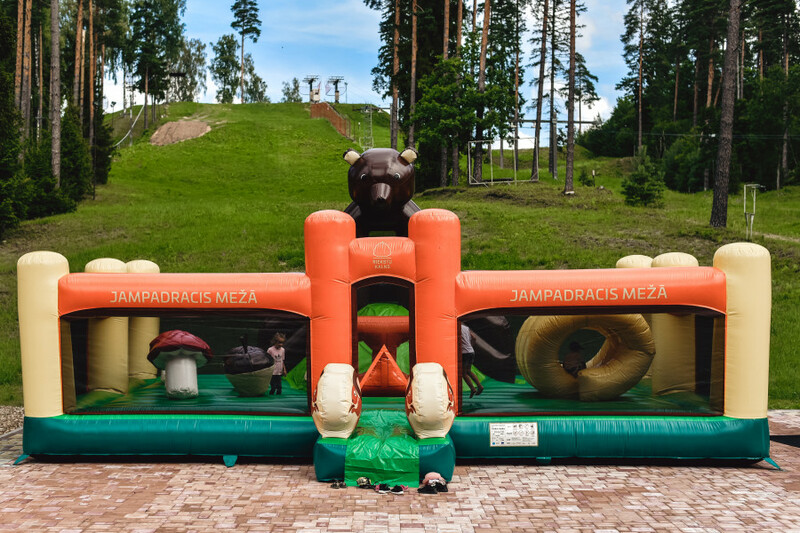 "Jampadracis mežā" is an inflatable attraction in which to have all the fun you can get! 2. Maximum 12 people in the attaction. 3. Don’t wear shoes inside the attraction! 5. Don’t push or step on the sides of the attraction and lean over them! 6. 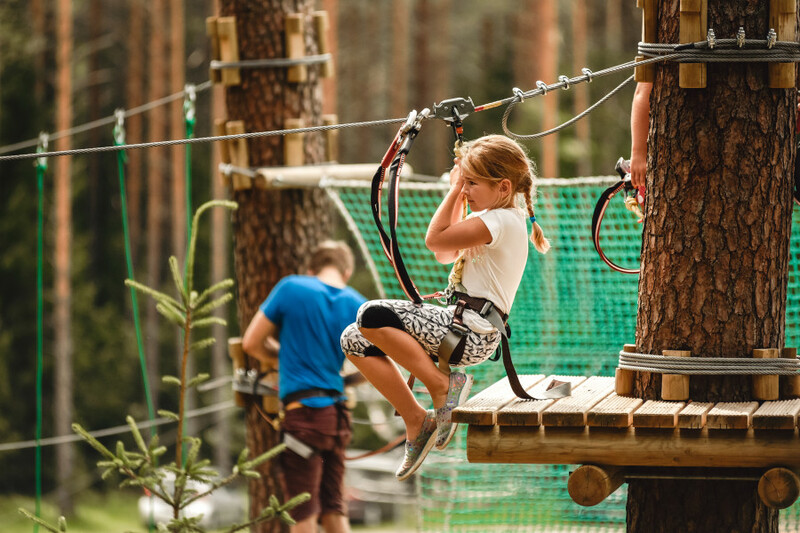 It’s forbidden to enter the attraction without the instructor’s permission! 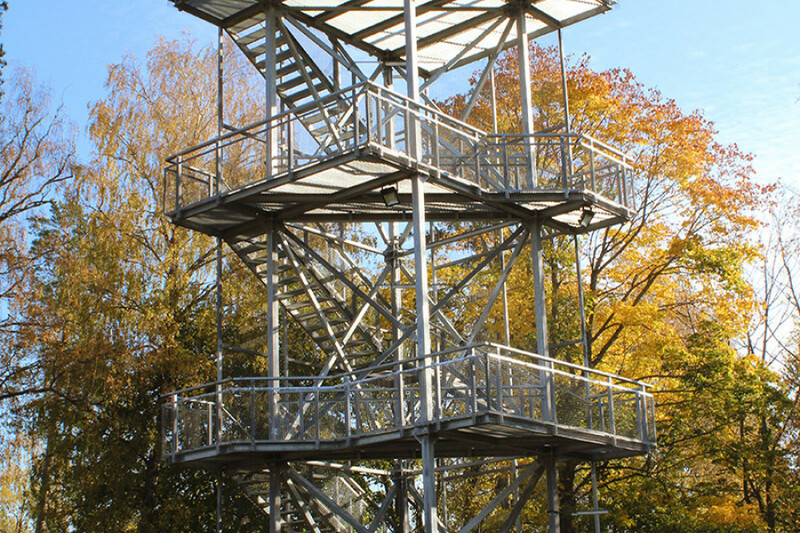 In the summer of 2018 an observation tower was opened in the newest part of Riekstukalns. It is 16 m high and is accessible to residents and tourists free of charge. From the tower there is a charming view of the gorgeous nature of Latvia, as well as the capital city of Riga and its tallest buildings. Maximum 30 individuals are allowed in the observation tower simultaneously, they have to be placed evenly on the platform with no more than 10 individuals on one side. 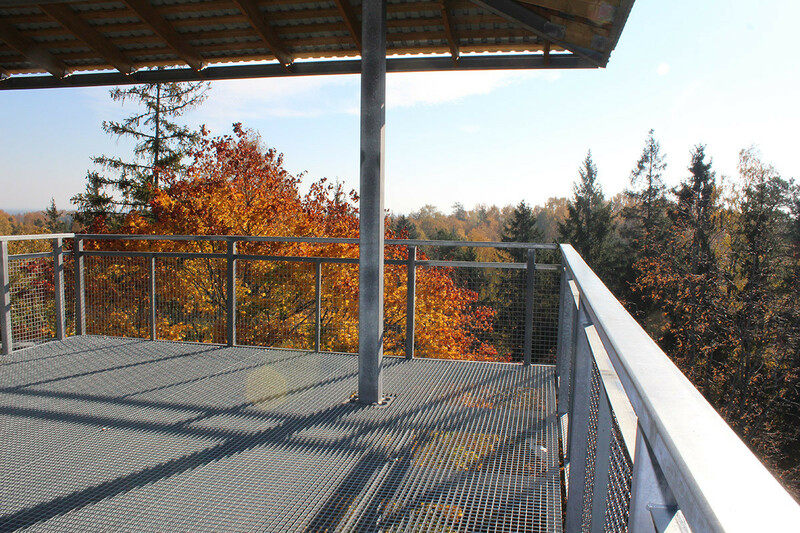 Children under the age of 12 are allowed in the observation tower only if they are accompanied by an adult. Please note that the platform and the staircase landing zones are made of grid and transparent material; besides, we recommend the visitors to use appropriate footwear and clothing to avoid any incidents. It may be dangerous to climb the observation tower with ski boots on! Please, assess your skills and safety! To lean against the platform railing; to bend or step over the platform or staircase railing. 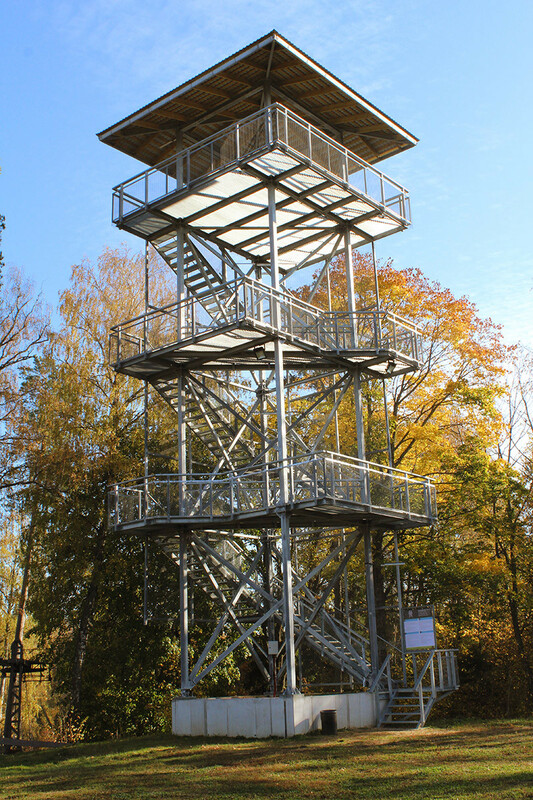 The highest platform of the observation tower is 16 m high, and the hill is 80 meters above sea level.